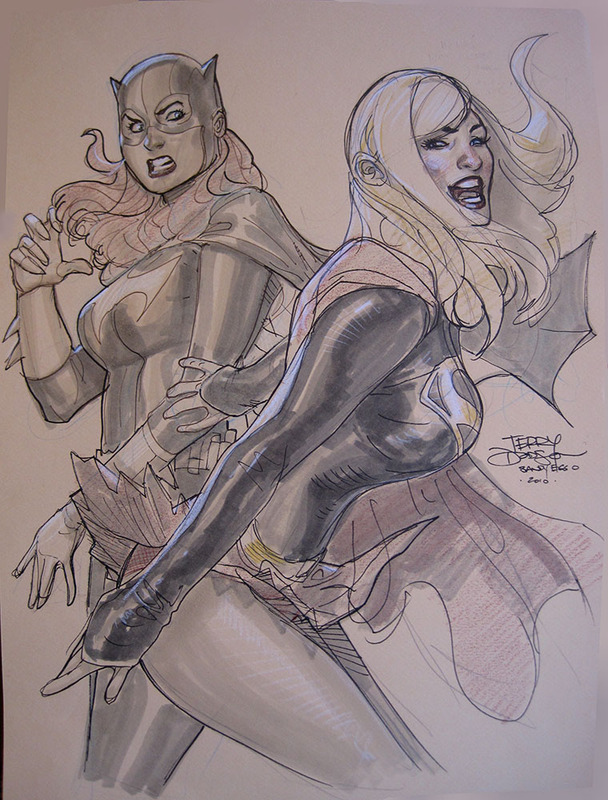 Here's the next commission sketch from Comic Con International, San Diego, July 2011, featuring Batgirl and Supergirl. Supergirl was drawn at last year's show and then Batgirl this year to complete the piece. Drawn on 12 x 16 Canson Pastel Paper with Col Erase Light Blue Pencil, Pitt and Copic Pens, Warm Grey Copic Markers and Prismacolor Pencils. 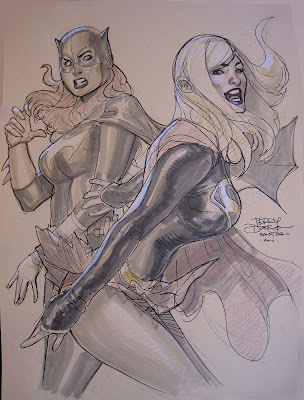 Here's the first commission sketch from Comic Con International, San Diego, July 21 2011, featuring the Turn of the Century Black Cat, Chatte Noire. Drawn on 11 x 16 Canson Pastel Paper with Col Erase Light Blue Pencil, Pitt and Copic Pens, Warm Grey Copic Markers and Prismacolor Pencils. Wrapping up my convention commissions this morning on the last day of SDCC in sunny San Diego. I will be posting them up this week for all to see! I will be appearing at CCI San Diego, July 20-24 2011 at booth 4706. I will be at the booth most of the show - Rachel won't be there this year - so I will be manning the booth solo! I will be signing books/comics/statues/etc at my booth the whole show. I will take sketch requests at 6:00-7:00 PM Wednesday and 10:00-11:00 AM Thursday. I will write down the first 50 names HOWEVER I will be choosing myself who's sketch I'm drawing and if you had a sketch recently I won't be doing you a sketch so I can try to get sketches down for fans who I haven't done sketches for! And San Diego is VERY busy con so I will be producing between 5 and 10 sketches TOTAL. Sketches are $200 each for a single figure. 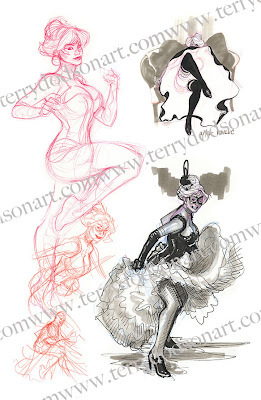 My new sketchbooks "Reveries" and "Bombshells 5" will be debuting at the show. "Reveries" will be a 5.5" x 8.5" Full Color sketchbook in a signed and numbered limited edition of 500 copies for $25 each. "Bombshells 5" will be a 5.5" x 8.5" Full Color sketchbook for $15 each. 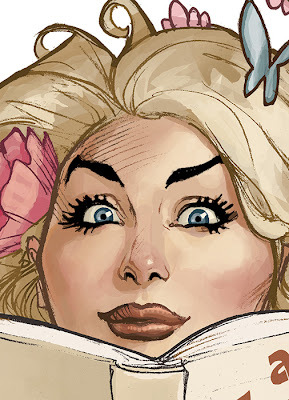 I will also have a limited number of last year's "Bombshells Book 1". I will be selling original art from Uncanny X-Men, Wonder Woman and selected covers, pinups and sketches PLUS some brand new art from Rachel and I! I will also have new prints for sale. The full version of my OTHER Sketchbook cover. It's a wraparound cover. 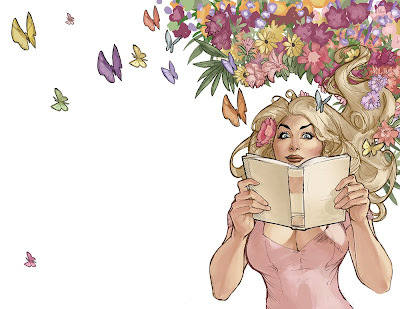 More info, details and previews about the book next week. 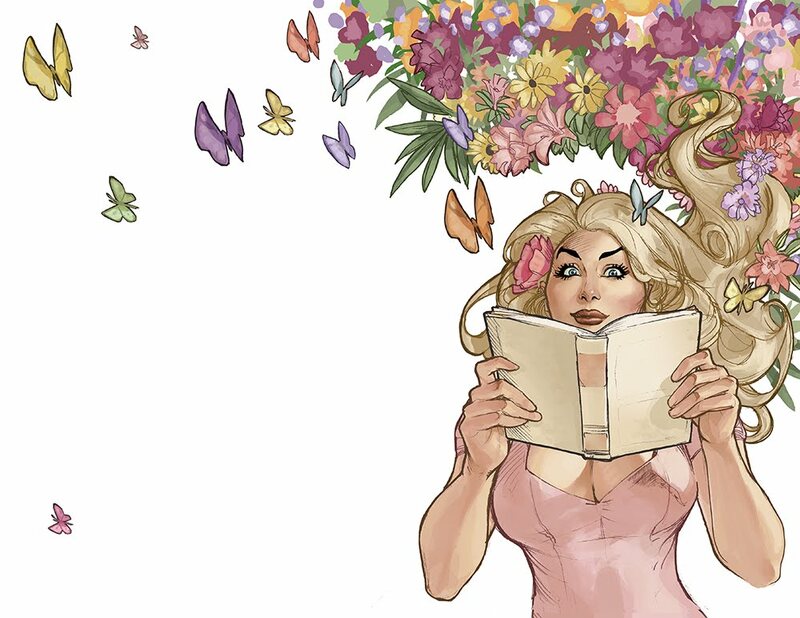 Here's a little preview of the cover for my other sketchbook coming out this summer! Here's another preview from "Bombshells 5 A Terry Dodson Sketchbook". It features me trying to figure out what I wanted to do with the cover. I knew I was going for an old fashioned poster in the Moulin Rouge, but was playing around with the amount of "action" for the figure, opted for a more stable image - let the "picture" be the action.